Capt. Leonard C. "Chuck Burger"
Capt. Chuck Burger was born in Philadelphia. He served in the U.S. Navy during World War II. After the war, he flew for American Airlines before joining Seaboard. During several furloughs, he became a skilled house builder. After a coronary-bypass operation, he took medical retirement in 1980. He then built a house in the Florida Keys and spent the rest of his life pursuing his hobbies of carpentry, flying radio-controlled model airplanes, and fishing. He was known as someone who was always available to help a neighbor. Chuck is survived by his wife of 54 years, Mary Rouse Burger; his daughter, Cheryl; his son-in-law Norm; and two grandchildren. 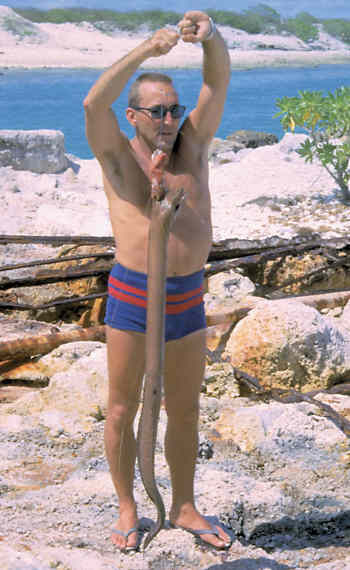 He is seen here in 1966 on Wake Island with a moray eel.